Teens have their own section at the northeast corner of the library. An aluminum panel on the exterior is cut with quotes about books and libraries. Photo by Nic Lehoux. 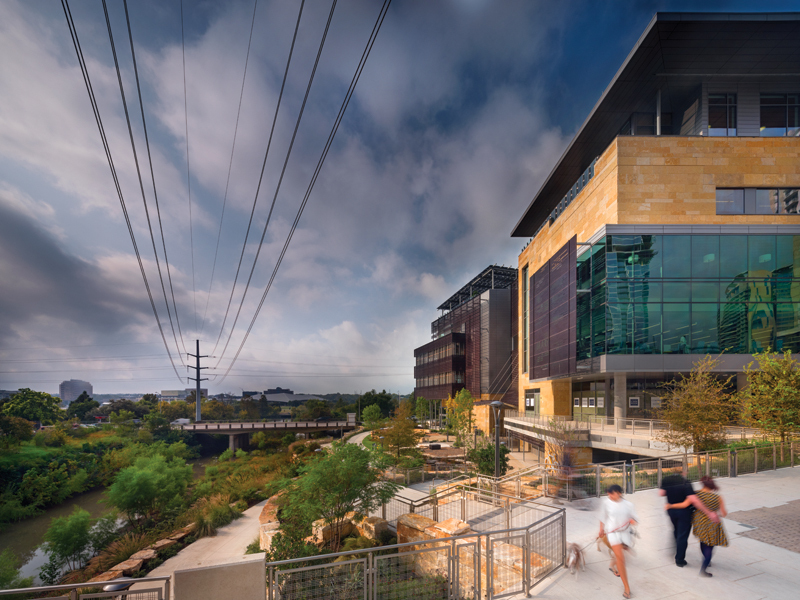 The east elevation overlooks landscaping that connects the project to Shoal Creek. A bridge, installed as part of the project, connects 2nd Street across the waterway. Photo by Nic Lehoux. At the southwest corner is a sign that indicates the building’s function. Photo by Nic Lehoux. The atrium is bustling and full of daylight. Stairs link each floor in a randomized but well-choreographed procession. 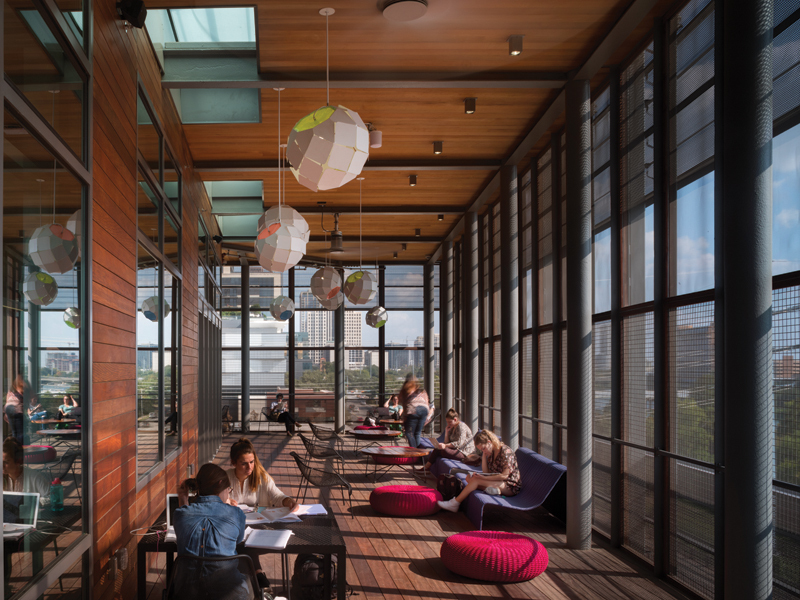 A glazed wall provides views of Shoal Creek and downtown Austin. Photo by Nic Lehoux. 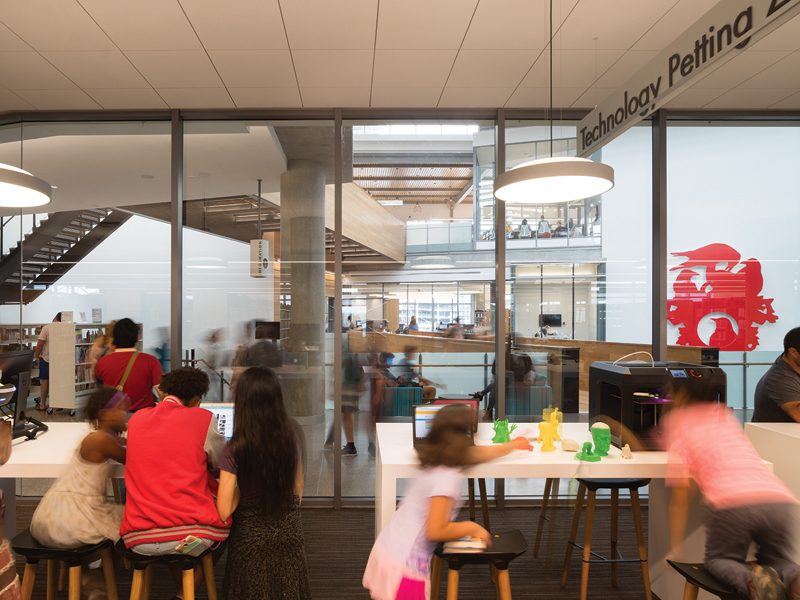 The technology petting zoo has proven a popular destination for library visitors. Photo by Nic Lehoux. 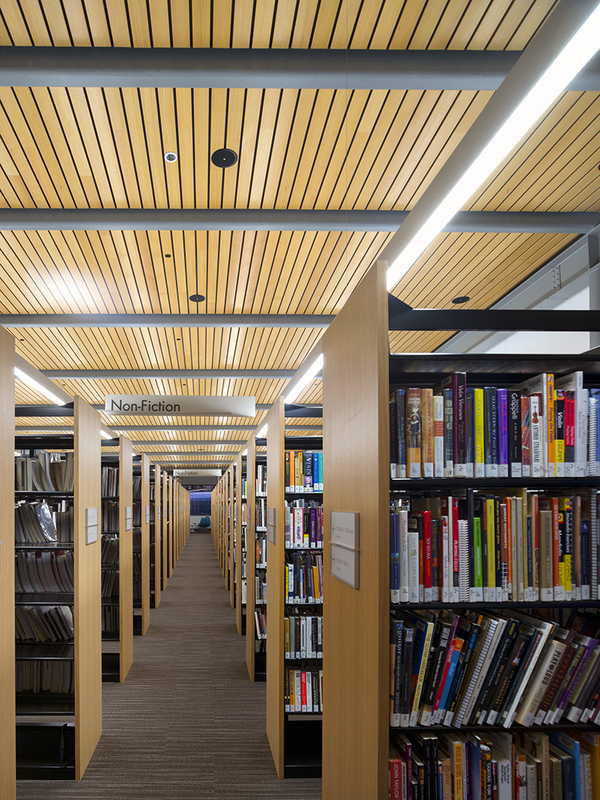 The new Central Library has twice as much room for books as the facility it replaces. The stacks can be easily rearranged at any point on the heavily structured floors. Photo by Nic Lehoux. The quiet reading room offers a place of concentration in a building that is otherwise busy with activity. Photo by Nic Lehoux. The screened porches face southeast to catch the prevailing breeze. Photo by Nic Lehoux. 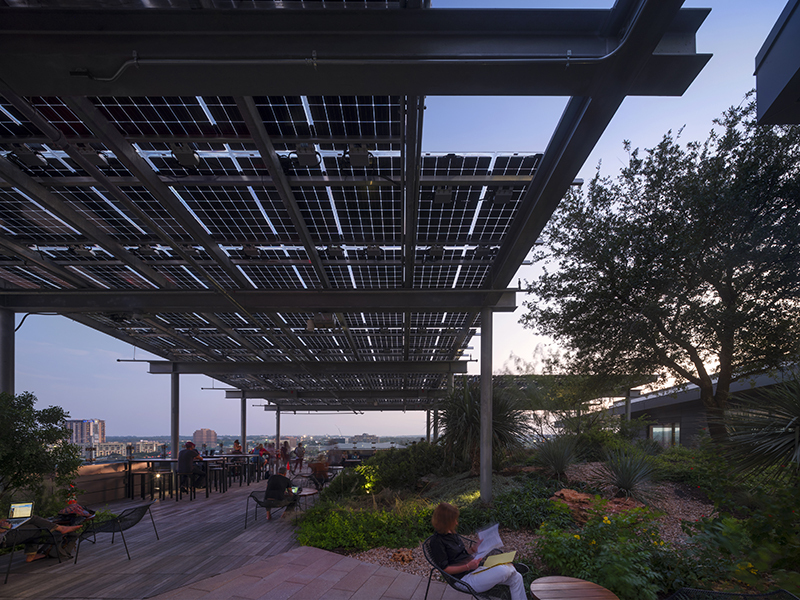 The roof deck is shaded with PV panels. The garden is planted with native vegetation specifically selected to attract butterflies. Photo by Nic Lehoux. 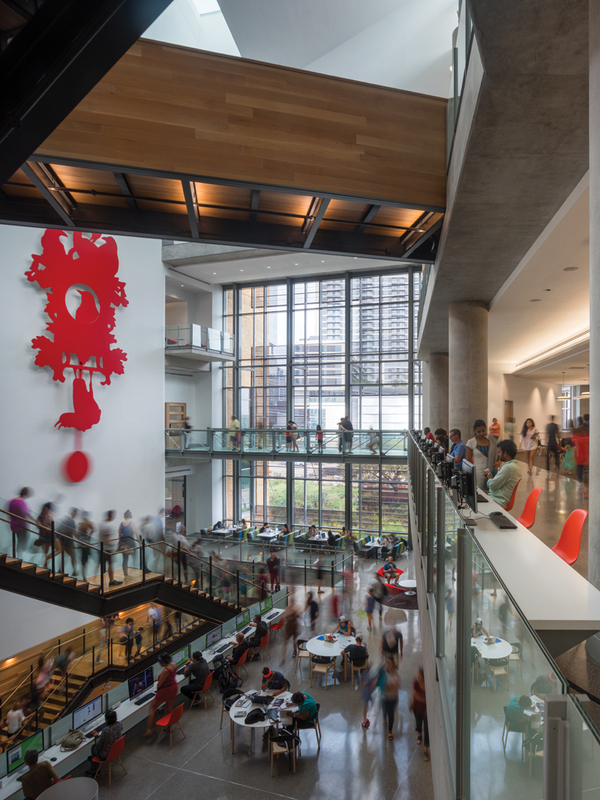 Austinites have embraced their new Central Library throughout its first months of use. This is welcome news, considering that its long-awaited completion was filled with anticipation — and sometimes angst, due to its cost ($125 million) and to schedule delays that pushed completion 12 months beyond original estimates. 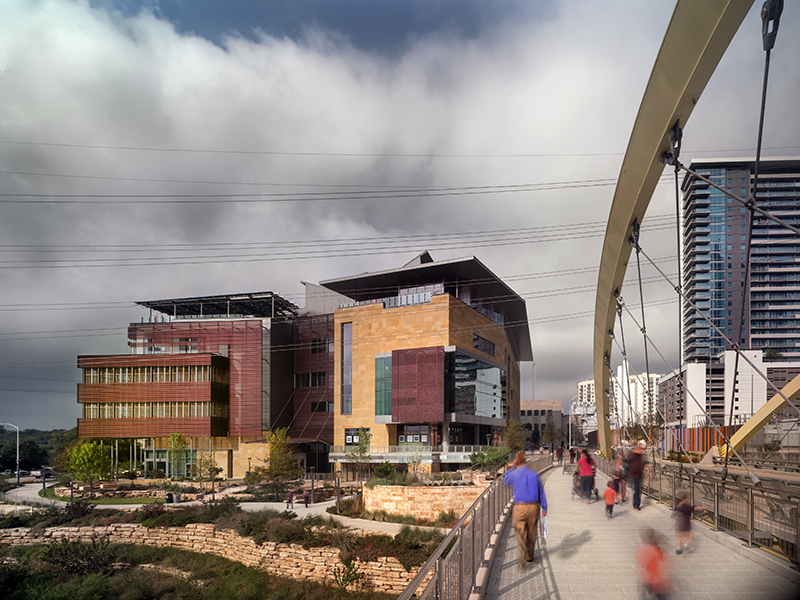 Yes, the Austin public has quickly moved past any complaints it had during the design and development phases of the project, to an overwhelmingly positive refrain. 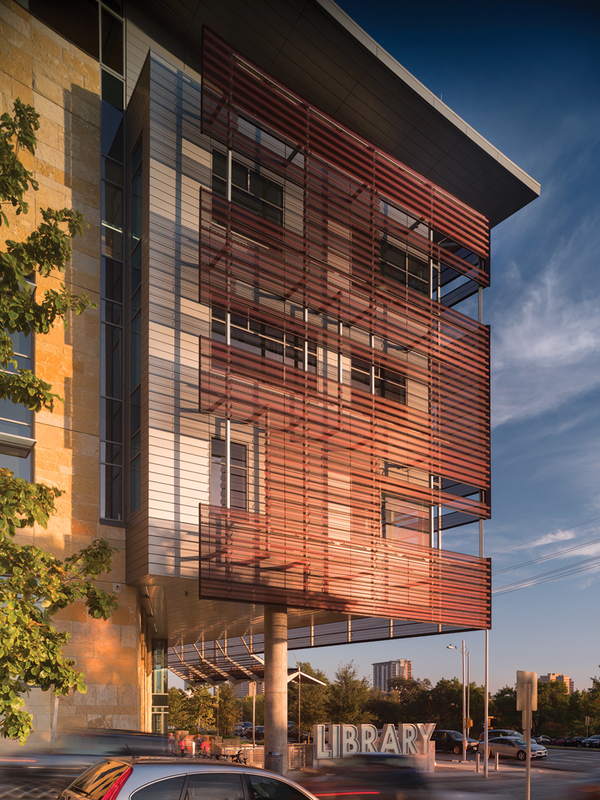 Texas Architect Editor Aaron Seward becomes, with this parallel article, one of the first in the architecture community to comment, calling many architectural facets of the library into question and addressing some of the ways that architects consider and gauge good design. Do our personal and collective opinions complement those of the general public, or do they contrast with them? As we ponder both common ground and misalignments of opinion in the two groups, the public continues to indicate that this landmark project clearly has met its expectations, and then some. 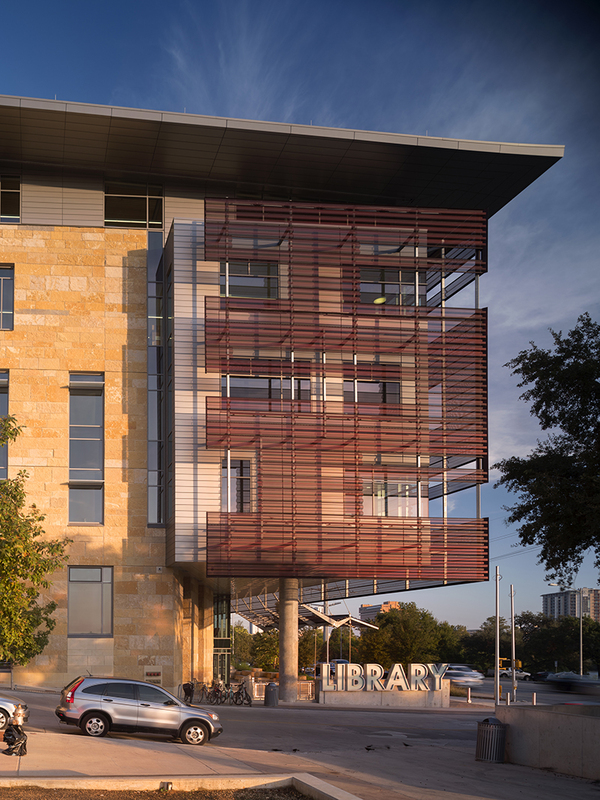 Sometime during the 1990s, a collective desire for a new central library found voice in a citizen group, created by then-Austin Mayor Kirk Watson, that assembled a variety of library stakeholders and solicited their input. This group produced a series of recommendations, including developing a city-wide facilities masterplan and replacing the Faulk Central Library — at that time less than two decades old. Since then, the Faulk Library has continued to offer much-needed access and community services, despite its misalignment with many current needs and desires, such as more parking, public meeting spaces, and technology — as well as a mode to address some patrons’ discomfort with the homeless community being a primary user of the space. In 2006, voters approved bond funding to replace the Faulk Library, and more formal planning was initiated. A smaller number of posts, often accompanied by smartphone photography, include comments on the architecture itself. The collection of stairs within the atrium has been described as Harry Potter-like or designed by M.C. Escher. 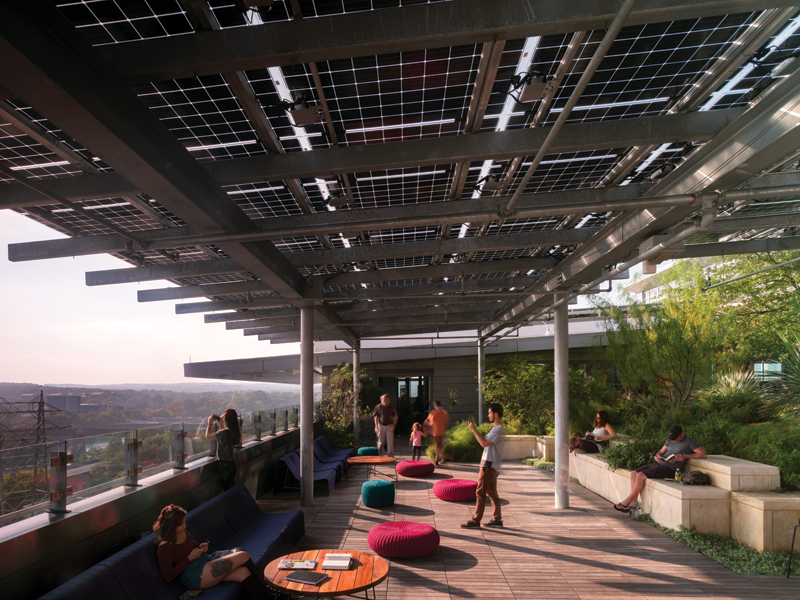 “Serious views” have been captured from reading porches and roof garden, both oriented to the southeast. 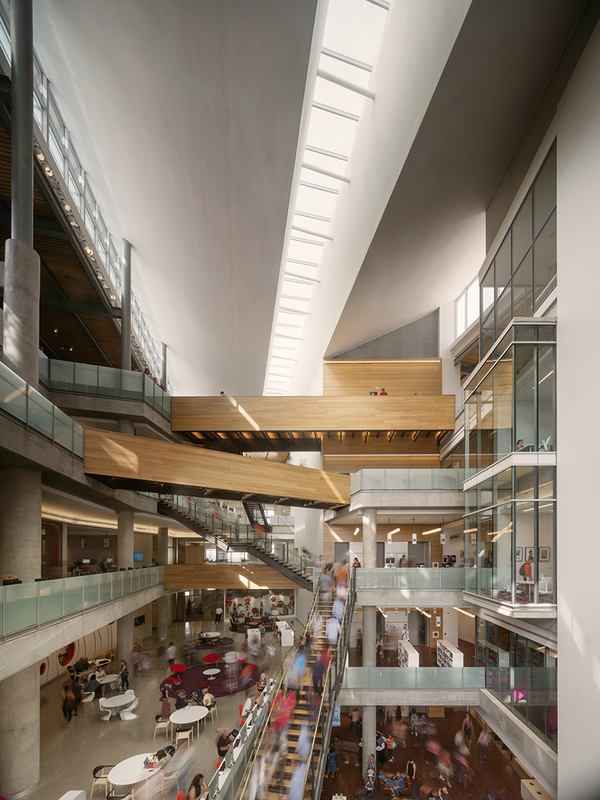 The daylit atrium has become the most common place for selfies and posed group portraiture, with views east through the expansive glass to what the public simply calls the “grackle clock.” Furthermore, mysteriously, two upper atrium windows, operable and positioned for smoke ventilation and maintenance access, have been nicknamed the “doors to nowhere.” The door hardware, installed by mistake, has been cause for hilarity in both children and adults, leading to more selfies (and more Harry Potter references). KUT 90.5 recently solved the mystery and confirmed that the doors are kept locked. James Edwards, who considers himself part of the homeless community and frequents the new library, commented on how much he appreciates the open space and the design of the atrium: “There is so much room for everyone,” he says. Edwards echoed comments from others in the community about magnificent views, increased access to new computers and other technology, and comfortable seating throughout. Another homeless gentleman questioned the volume of the atrium in connection to the growing crowds, asking if the amount of floor area lost was worth it: “Can this library keep up with Austin’s growth?” As it did in the Faulk Library, APL staff along with social work interns from local universities will continue to serve library patrons struggling with homelessness or in need of other social services. This support will take the form of one-on-one assistance and referrals to resources offered by others in the community. 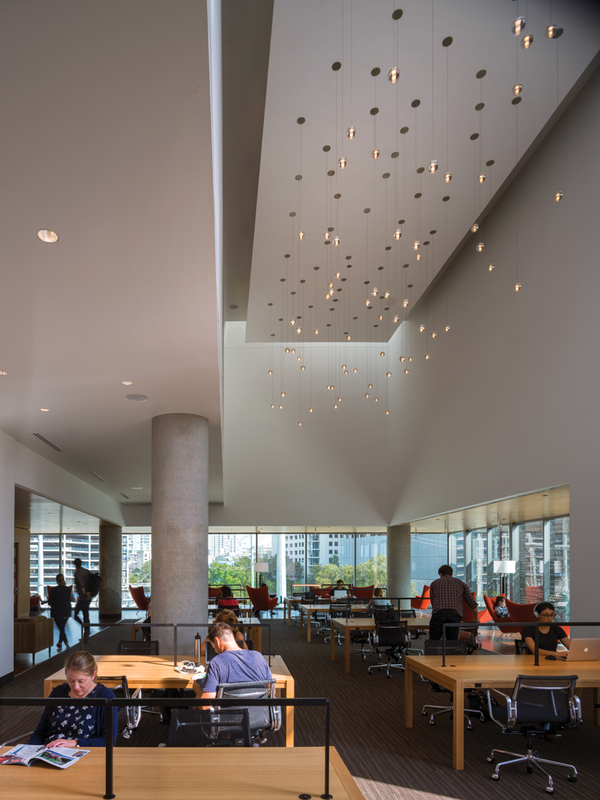 Like the public, the local architecture community has been sharing its opinions about the new library, and recounting their experiences to other architects of overhearing library visitors comment (in real time). For most, it’s been remarkably satisfying to hear the public take notice of the physical environment and revel in the space. As architects process the public’s response to this new landmark in relationship to Seward’s and our own architectural critiques, it’s an opportunity to collectively reflect on professional practice in the age of free-flowing comment. 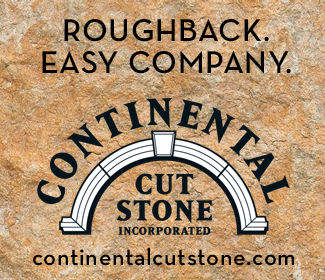 Will these new sources of feedback alter our priorities or those of our clients? Will the definition of design excellence continue to expand and evolve? In the midst of sweeping shifts in communication, the public’s comments are pointing to a collective yes. Sarah Gamble, AIA, is architect of the Texas Main Street Program, a community revitalization program within the Texas Historical Commission.